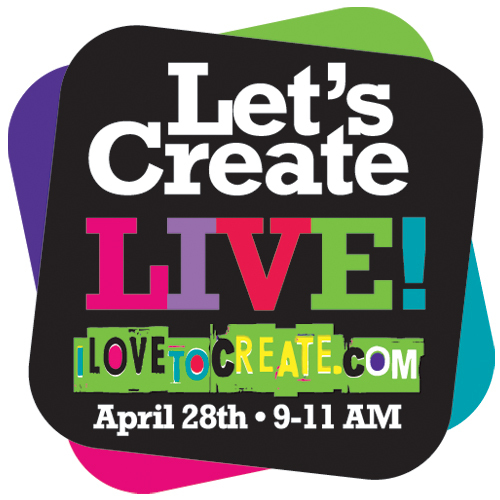 iLoveToCreate Blog: Let's Create LIVE! is almost here!! Let's Create LIVE! is almost here!! Well folks! After several months of planning, our Let's Create LIVE! event is just about here! From 9-11 AM (Pacific Standard Time) we will be broadcasting LIVE from our iLoveToCreate® studios via our Ustream Channel!! Hop on over early and signup for a username and password so you can participate in the chat and enter all the wonderful Let's Create LIVE giveaways we are offering up (over a $300 value combined)! Here's some final details about our lineup! – PattieWack is our Let's Create LIVE! host and she is amped up and ready for the show! She will bring enthusiasm to the like no other! – Our crafty superstars for the event will be Kathy Cano-Murillo a.k.a. Crafty Chica, Jen Hadfield of TaterTots and Jello, Jennifer Perkins of Naughty Secretary Club, Lead Fiskateer Angela Daniels, Traci Bautista of treic Designs, and Tiffany Windsor of Cool2Craft! They'll be revealing their Let's Create LIVE Designer Challenge projects LIVE on camera! We can't wait! – Our amazing in-house designers will be there too!! We'll be having live demos featuring Colette Trejo, Tar'Lese Rideaux, Allee Marderosian, and our Tie Dye Dudes Steve Ha and Matt McCort! – Some of our other amazing in-house team members (and artists and DIYers on the side) will be there partyin' it up too! – Mr. Tacky Glue will be adding his own comedic spin to the event, so be prepared for the LOLs! – We'll be doing fun demos of our new Tulip® Beads in a Bottle™, Tulip® Liquid Dye™, and Tulip® Body Art® that have just hit craft store shelves! – We'll also have lots of other unexpected fun and surprises. You don't want to miss out!!! Please forward this link to your friend or tweet or Facebook about the event. We appreciate your support SO much!